I have blogged about both options 1 and option 2 previously, but with Sitecore 9 release there are some updates. 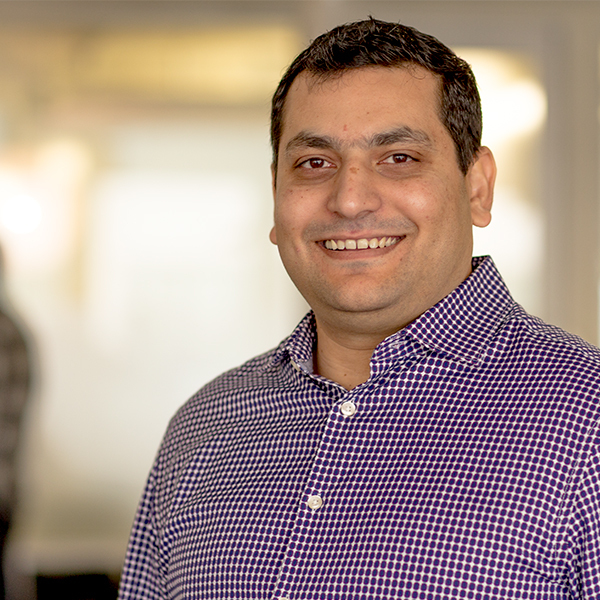 This blog is just a follow up about the changes since last release and it is based upon Sitecore 9.0 and Sitecore Azure Toolkit 2.0. 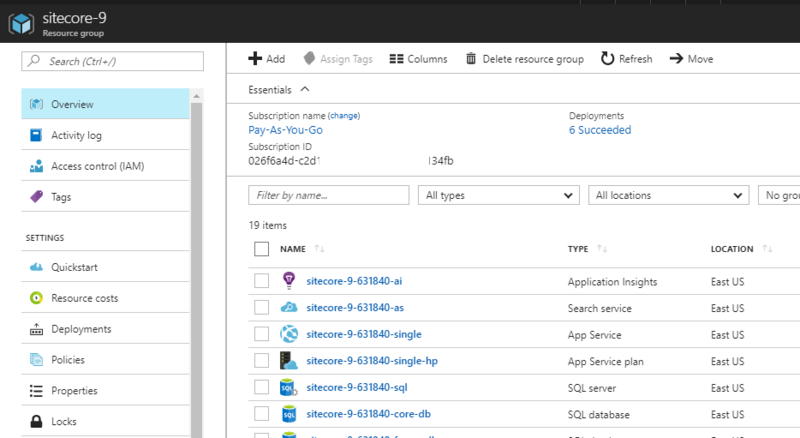 The Azure Market Place module for Sitecore has been updated with a nice 4 step wizard. The configuration wizard will ask you to choose your Sitecore version, choose your region, add your own credentials, review legal terms and conditions, click the magic button and let Azure do its business. I believe any non-technical person with an Azure account can do this installation without any help or bugging IT to setup servers for Sitecore 9. 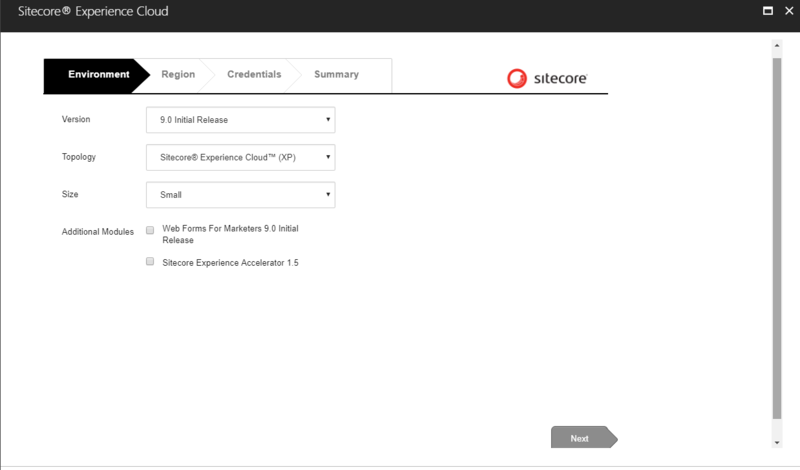 Bonus information, you can tick the box for Sitecore Experience Accelerator 1.5 during the installation wizard and SXA will be installed as well for you to play around with 80+ pre-built components like Carousel, Gallery and so on. The following screen shot from the Azure portal is showing different resources that were deployed successfully after I ran the Sitecore installation wizard for Single (CM & CD combined) size. This is slightly more technical option as you will need to manually configure ARM templates (read JSON files) and use Windows Powershell. I have blogged in detail about this earlier so I will not go in details this time. I will only mention what I found was different for Sitecore 9 installation and the issues I ran into during the installation process. You have to supply a secure certificate’s blob and it’s password within the parameters file. You have to use ArmTemplateUrl parameter instead of ArmTemplatePath for the Start-SitecoreAzureDeployment command. Waited about an hour or so and the XP installation was up and running on Microsoft Azure Platform. If you look closely in the screen grabs above, 19 resources were deployed during the single type of installation and 31 resources were deployed during the XP installation. Initially, I was using ArmTemplatePath and was providing the full path to the template on my local machine, but it turns out, that I needed to provide ArmTemplateUrl as mentioned in this blog. Supplying the correct parameter with Github’s path resolved this error. I was supplying the path to the certificate instead of the base64 encoded string. Thanks to the Sitecore Slack community that came to the rescue and I was able to resolve this by generating the secure certificate correctly and supplying it’s blob value. 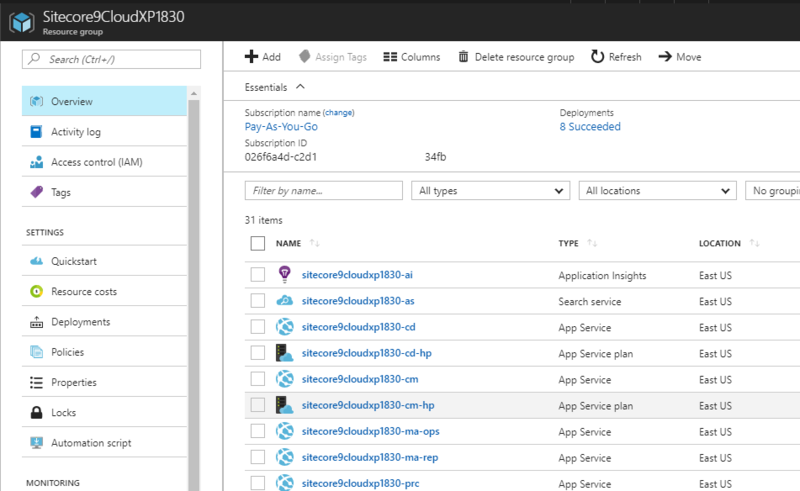 I hope it is going to help if you are doing Azure ARM deployments with Sitecore 9 in coming days! In almost all the projects I have done in past year or so, a common requirement among the clients have been that they want the ability to add Twitter Pods on pages and also have the ability to change the account name based upon their campaign or department. For the purpose of the post, I will be using Sitecore CMS and LINQ To Twitter library to show how simple it is to create a Twitter Pod/module. 4. As per Twitter API 2.0 you need to get Consumer Key, Consumer Secret, Access Token, Access Token Secret values from http://dev.twitter.com for any applications that you are creating. Log-in there and follow the steps to get these values. 11. Create a Sublayout for this User Control and add it to the Sitecore Layouts. Note++: Umbraco and Episerver CMS can also use the same code with different CMS based API. This is just a quick post to show how to get image URL via code behind. In a recent project, I have to update certain fields of sitecore item when the item is saved in sitecore. 2. In web.config under <events> find , <event name=”item:saved”> and append your handler at the end.